Thanks to All Who Made the 11th Annual Shamrock Shave a Great Success! OVER $400,000 RAISED SINCE 2008! OVER $24,000 RAISED IN 2019! Thanks to all of you for your efforts in making the 11th Annual Shamrock Shave (held last March 9th) an incredibly successful fundraising event for our parish community and for cancer research. Thanks to your efforts, we collectively raised over $24,000 for the needy in our community (St. Vincent DePaul Society) and cancer research (Bear Necessities Pediatric Cancer Foundation). We also had 24 men, women and children Shavees, an estimated 400 adults and children in attendance throughout the evening, and served over 200 Irish dinners! It is great to see our parish pull together and “answer the call”. To see members of the Knights of Columbus, St. Vincent de Paul Society, CRHP teams, Jacobs Interact Club, Westfield Beta Club, the Algonquin Lake in the Hills Fire Department, the Algonquin Police Department and other parishioners volunteer to make the event happen has blessed our Parish Family is so many ways. Thanks to your commitment to the event, we exceeded our goal and had a lot of fun raising money for two very worthwhile causes… more than $24,000! To All the Shavees: Your commitment to the parish community and helping those in need is inspirational… may your bald heads be examples to those in the parish and community of our parish’s commitment to charity! To the 2019 Shamrock Shave Planning Committee (Jonna Burck, Greg Freund, Andre Manaois, Lori & Dan Kotleba, Sue Czech, Leann Granell, Deacon Bob Armstrong, Amy & John Schneider, Ken Prigge (Chef) and Ingrid Prigge, Financial Advisors Larry & Julie O’Brien, Chris Cimaglio, Bob & Sue Witte, Susan Kuznieski, Norma O’Neill, Ed & Carol Majkrzak, Mark Minaglia, Mary Ann Watt and Richard & Michelle Arden), Kevin & Julie Fitzgerald, Patrick Colcernian, Scott & Ann Nejman, Rene Mendez, Joanne, Lisa Gruver, Ingrid Prigge, Ken Prigge, Amy & John Schneider, Michelle & Dave Campbell, Michael Kouvelis, Christine & Rob Retzer, Tim O’Neill and many others that came out to help. Thank you for all of your hard work on event day, and your great creativity and planning for the Mane Event! To the Event Volunteers including members of the following parish groups and ministries who helped ensure the event ran smoothly: Knight of Columbus Council #11091 and the St. Vincent DePaul Society. We also want to thank our Charity Challenge Teams representing the Algonquin Lake in the Hills Fire Department, Algonquin Police Department and Team Talia. Lastly, thanks to our Pastor Fr. Peter and Associate Pastors Fr. Witold and Father Daniel for their support of the event and for their own sacrifice as Shavees! Thanks to each and every one of you for your contribution of time, talent and treasure in support of these two very worthwhile causes. Please Note: Any outstanding Shamrock Shave pledge money may be turned into the Parish Office or the payment may be made online by April 1st. Please specify your “Shavee” when submitting your pledge donation. Thank you! Why Should You Sponsor a Shavee? Because we need your help and 100% of event proceeds are being donated to two great charitable organizations! 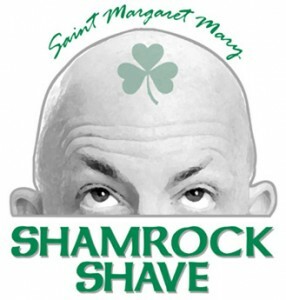 In the last eight years, the St. Margaret Mary Shamrock Shave, through the generous support of our shavee pledges, raised over $375,000 for needy families in our community and those suffering from cancer. This year, the recipients of all event proceeds will be (2) extremely worthwhile charities that will fulfill our mission of helping the needy in our community and those suffering from cancer. They are the St. Vincent DePaul Society and Bear Necessities Pediatric Cancer Foundation.